Jonathan's Birding Blog: Rainham Marshes RSPB - From Passenger Pigeons to a magical Merlin but not forgetting Lagopus lagopus scotica. All a bit of a Circus really! Rainham Marshes RSPB - From Passenger Pigeons to a magical Merlin but not forgetting Lagopus lagopus scotica. All a bit of a Circus really! Walking along the riverwall from Purfleet station to Rainham Marshes RSPB in a gale in the dark on a Friday evening (29 Jan 2016) is perhaps not everybody's cup of tea. The purpose to take in Dr Mark Avery's Fighting for Birds talk being hosted at the centre that evening. It was a well received event and a fascinating account being split up into 2 parts - firstly the historical aspects and the shocking demise of the Passenger Pigeon, thought to be the most numerous bird in North America in the 1800s, with part two concerning the impact of driven grouse moors on Hen Harriers amongst other aspects. With thanks to all for a brilliant evening. Looking forward to reading 'Inglorious'. On walking to and from the centre it was certainly an eye opener to see the light polution of the metropolis to the west. If you go to Rainham Marshes RSPB and do a riverwatch from the balcony you can get distracted by model aircraft being flown over the Kent side, especially on a quiet birding day. They do 'loop the loop' rising on the vertical as they break the horizon of the river wall chasing imaginary prey. Sometimes you think you've got a raptor only to be disappointed seconds later! No such aircraft spotted today, so why mention this? This Saturday (30 Jan 2016) about a mile or so west of the centre I witnessed a true avian equivalent. 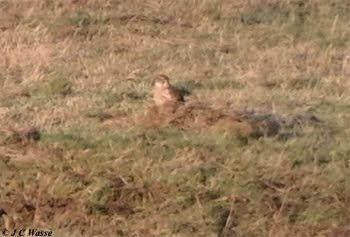 It was after arriving at the Serin mound before 4pm on the 'long walk' back to Rainham railway station. Target was to wait to see if the Bittern, that had been sighted over several days on the reserve, would fly over the marsh as dusk approached. I set up the 'scope and scanned the marsh through 'bins. Straight away a small dark bird of prey apparently in pursuit was flying over the first field. 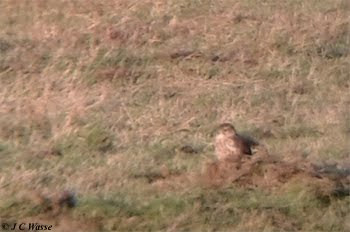 After a few quick turns it landed in the field and a lone pole helped as a marker in picking up the bird in the 'scope. A female/immature Merlin. I managed to rattle off some right at the limit phonescoped photos of it as the light was still reasonable, and got the message out on twitter/text. It stayed in view for several minutes and allowed for other birders/photographers newly arriving at the mound to connect. It flew off in pursuit and was lost to view. About 4.25pm I picked up the bird absolutely motoring along low over the marsh at mid distance, so low it was barely above the ground and easily lost against the fragments of reedbed occasionally blocking the view. It continued to show on and off until 4.45pm. During the time at the Serin mound it was in hot pursuit of passerines on 2 or 3 occasions forcing them up off Wennington Marsh and vigorously chasing them in mid air, reminding me of the rising of the model aircraft mentioned earlier. It appeared relentless in pursuit of supper but was only successful close to dark when it was plucking something on the ground in the falling light. It was great to see a Merlin hunt, especially being able to follow it as it flew low over the marsh and witness its tactics of forcing the passerines up into the air and continue chasing them over the skyline. First time I've definitely seen Merlin at Rainham Marshes RSPB, two probables in the past which both zoomed by in a blink of the eye and could not be nailed down. Two Short-eared Owls played second fiddle on this occasion as they patrolled the edge of the marsh, and there was no sign of the Bittern from Serin mound up until leaving at just before 5pm. Other highlights from today was a Knot which we saw briefly in Aveley Bay in the morning and then again in the afternoon in flight over the reserve with a flock of Dunlin heading towards the Target Pools at high tide. Water Pipits continue to be showy with singles frequenting the Target Pools and the riverwall respectively, and Marsh Harriers took to the air as the dull grey morning turned to sunny spells. Within the book 'Frontiers in Birding' by Martin Garner and friends Martin invites the reader never to lose the ability to enjoy the wonder of birds, and to go and discover new things for yourself and others. 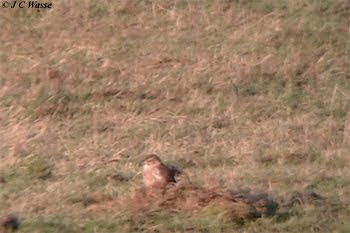 Watching the Merlin hunt and being able to study its tactics was such a wonderful moment. Martin sadly passed away recently and the tributes paid to Martin on the internet show how inspirational he was to birders and non birders alike, including birders who never met him but have been able to share his passion for birding through his work on pushing the boundaries of bird identification.